It rained throughout the night, and the air con cycled on and off annoyingly, blowing cool yet damp air onto us, growling somewhere within arms length on the other side of the oustide walls. I did not sleep well, the clothes I rinsed and hung out were not more dry but more fermented, but really, it's just for a night, and I'm sure they'll dry soon enough. Mildly interesting, but not anywhere that I want to return to. 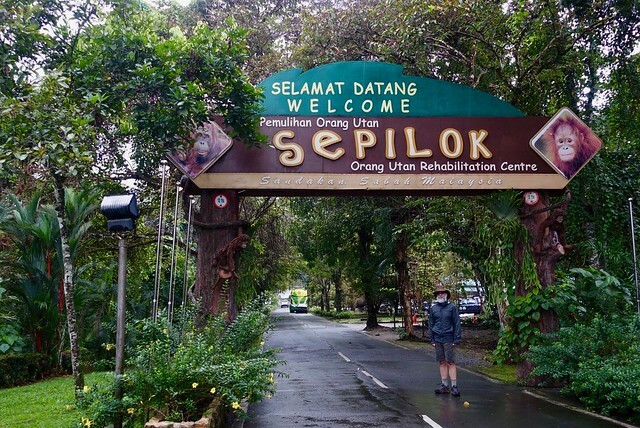 One of the main attractions of the place is that it's just 200m from the entrance to an orangutan orphanage (erm, rehabilitation center), now run by the state of Sabah. We sloshed over there in a big rain, and went through the indocrination--while the center is part of Sabah Wildlife, it's also tied to some British appeals organization, where one of their volunteers showed a very earnest and concerned video about how they save orangutan babies, including holding up headshots of five babies and reading off their profiles ("Peanut is smart and clever, and loves scampering about in the trees!") and encouraging you to adopt one for a low low fee, as the video shows the keepers putting the animals in diapers. Maybe this appeal works to bring the funds in, but it struck me as eccentric, like some cat lady soliciting donations as she introduces you to all the strays she's collected, telling you their life stories. The enterprise struck me as unscientific and ill-disciplined: would my donations go towards actual conservation, or pink footy pajamas for the baby apes? 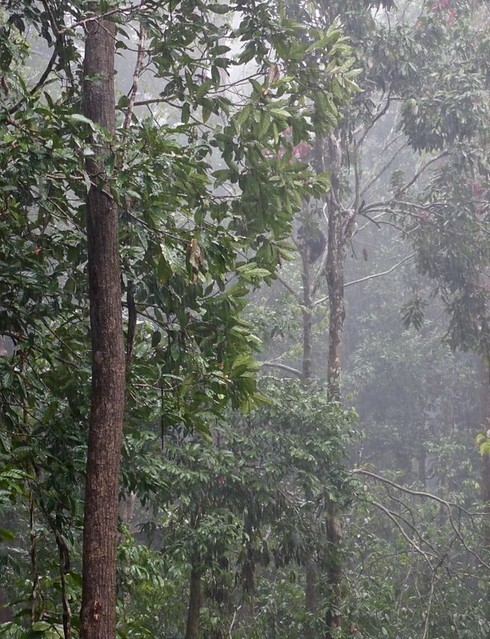 And where's the actual concern for where these critically endangered primates live? Orangutans live in rainforest, which is still rapidly being converted into palm oil plantations; you can see the freshly graded hillsides stripped of rainforest as you fly in. Uh, nevermind that, let's look at baby pictures. Hmph. I kinda felt sad, these people do have good intentions but they're not going to be successful. 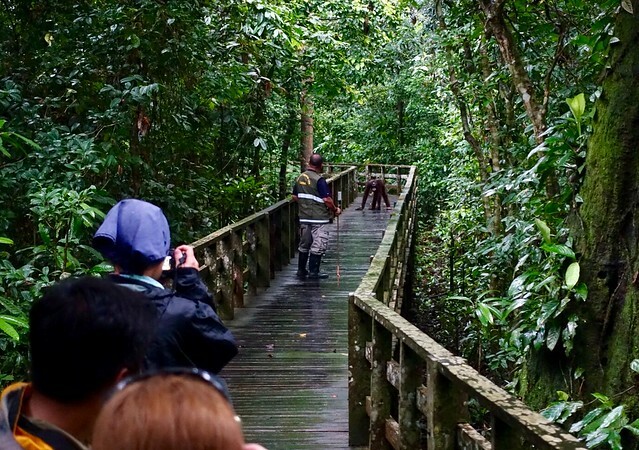 At 10:00, there's a feeding, where lots of apes (us) stand around and look at other apes (orangutans) at a platform on the edge of the reserve. We got there 15 minutes early, looked up at the ropes for activity, saw a very black squirrel... and that was it. 10:00 rolled around, nothing but another two dozen tourists. 10:15, a few more tourists. Where's the show we were promised, the performance? Finally we said to each other "there's no feeding today, let's go to the outdoors nursery" so we walked back... and saw two keepers cajoling one of the nursery orangutans to the feeding platform to eat in front of the guests. Heheh, the semi-wild orangutans didn't want to show up, so this guy reluctantly had to play standin. The orangutan reluctantly mounted the platform, saw the people... then went behind a tree trunk, turned his back to the 80 or so tourists, and ate his bananas alone. It was behavior I've seen at the orangutan enclosure at the San Diego Zoo--they get their food, know they're being watched, and intentionally turn their backs on you to eat in peace. After that forced feeding performance, we decided sure, let's go back to the nursery, which was fun--the youngsters were going about, not concerned with viewers, playing along the ropes, while the keepers attempted to keep the pig-tailed monkeys and the long tailed monkeys from sneaking in from the forest and eating the food. That was actually interesting to me--orangutans are huge, the males are even a bit larger than your average American male at 100kg--they must eat a lot of food and need a lot of territory? How does fragmenation affect them? What about the other half-dozen primate species? Are they increasing in population, competing with the orangutans? Answer: here's a baby picture of Peanut! He needs your dollars! Ugh, no. Let's go next door to see the sun bears. The sun bears are a bear species native to Malaysia; the ones in Borneo are small and love climbing trees. In the pouring rain, they're actually more active, not less, and we saw four of them: two snoozing in trees, two tussling on the ground. Yep, they're small. The signboards were more helpful in explaining stuff than the orangutan signs (were there any?) but there's still a bit of information lacking, like how the traditional medicine trade and poaching really affects the sun bears, things like that. Ah well, it was interesting to see them in a semi-native enclosure on their home turf. With that, we were done, and we headed back to the resort, feteched our luggage, then took a pair of short flights, first from Sandarkan airport to KK, then onto Brunei. We had some fun briefly browsing around the KK airport: I found some durian chocolates, and Chris grabbed some fine champagne at duty free for this evening (Brunei is a totally dry country, except for non-Muslims, who can bring in spirits or, strangely, "12 cans of beer"). We landed in Brunei--neat tidy modern airport--and grabbed our luggage as the call to evening prayer echoed through baggage claim, and were whisked away down manicured freeways at sunset to the Radisson. We both think that we'll. be back... there's still more to do and see here on Borneo; I'd love to hike to the tops of Mt Kinabalu and Mulu, do some more things in Mulu, explore some more... but for now it's time to rewind things and return home. And that was it: today was an meh ending to our time here in Borneo, and an very welcome ending to the very odd year of 2014.